I spent almost all of yesterday just working on the footnotes, trying to get Endnote to play ball. Don’t get me wrong, I do like Endnote. I used to enjoy writing my footnotes by hand, but the way that Endnote does it for me is, usually, enormously labour saving. But for some reason, yesterday, it got its knickers in an almightly twist and started putting in references to whatever manuscript it felt like. It wasn’t a problem with the books, or the journal articles, or the webpages: just the manuscripts. Since the chapter is based around manuscript collections, it caused a bit of a problem. I have no idea what caused the glitch, but I ended up typing in the manuscript references manually. I’ve also started secondary reading for my concluding chapter on the news. If anyone has any suggestions of things I should read on early modern news, I’d be very glad to hear of them. The reading that I’ve done this week surprised me by giving me several ideas for my first couple of chapters on ballad music. In fact, I had to leap out of bed at 11 one night this week to write down an idea! It’s the first time that that’s happened for a very long time, so I think I can safely say that the thesis is out of the doldrums and on the move again. This afternoon I briefly revisited my chapter plan, taking into account some of the comments that my supervisors made when they looked at it last and writing an abstract for the commonwealth chapter now that it’s completed. The rest of the afternoon I spent transcribing documents in the State Papers. For once, the handwriting is relatively easy to read. Unfortunately, the digital scan of one page is so dark that it is illegible in places – I suppose a girl can’t have everything. On Wednesday evening I went to the committee meeting for the Historical Association in Bolton. A very productive meeting and plenty of things to work on in the coming months, not least of which is putting together the programme of lectures for next season. These are just gorgeous, so I felt the need to share. Andre Amador’s Playa Paintings are Sandy Works of Art. After a couple of dodgy days at the beginning, the week has definitely ended on a high. I spent quite a lot of time at the beginning of the week consolidating the ideas that my trip to the British Library generated and I wrote a thousand words in a couple of hours, bringing together my thoughts . It was very satisfying, especially in the light of the 6 months I’ve been struggling with the 7000 words of the commonwealth chapter. In a sense, it made the chapter all the more frustrating. Although the chapter had improved, I was still really struggling to make it flow. Everything was there, in vaguely the right order, but with no grace and no flow. Cue accusations that the naughty child in me didn’t want it to flow yet. My response was along the lines of ‘get lost’. There is nothing fun about spending six months messing with the same set of words. But at least writing about London proved to me that I hadn’t lost it (whatever ‘it’ is) completely. On Wednesday night I did something a bit different. I read the chapter aloud. Perhaps I should have done it a long time ago, because it was so obvious when I thought about it, but it simply hadn’t occurred to me. I printed the chapter out and attacked it with a red pen and scissors. And it worked. Bashing it out line by line, aloud, showed exactly where the problems were and what didn’t make sense, what needed more explanation and what would be better broken down into more sentences. Thursday I spent typing up all the changes that I had made and by 2.30 that afternoon, I was a very happy girl. It’s not ready, by any stretch of the imagination, but it will do as a first draft. What’s more, it has lost its hold on my nightmares and no longer causes me feelings of guilt and insecurity. Maybe it won’t be the best chapter in the thesis (who knows, maybe it will), but at least I’ve now got something down that I’m confident about. I celebrated by unpacking a box-load of books. I’ve inherited another library, he second in three months, so my brand new shelves are now groaning under the weight of scholarship I could never have afforded to buy. Today I checked through the results of some searches that I ran on State Papers Online and found a perfect little nugget to help with one of my arguments, so I am very happy indeed. Finally, I’d like to pass on my very best wishes to Glyn Redworth who retires from the University of Manchester this week after more years than either of us probably cares to think about. Time to start a new chapter, in more ways than one. I spent this week working in the British Library, looking at lots of old manuscripts and some printed music. I’ve been looking for ballads in commonplace books and found some really interesting stuff. Yesterday I looked at the two oldest known pieces of English sheet music, which was amazing. Highlight of the week, though, had to be studying the Shirburn ballads, an early 17th century collection of ballads, some with music, which had been taken off display in the Ritblat gallery so that I could work on it. Absolutely fascinating. I’ve written before about how much I love the British Library building. I just wish it were further north and there was a bit more natural light – I’ve hardly seen daylight all week. I made some very useful discoveries while I was there and the amount of resources that I was able to look at because I was there all week instead of just a couple of days really helped me to gain an understanding of the bigger picture. I’m now able to see the manuscript miscellanies that concentrate on ballads within their wider cultural framework. Having the time to look at so many different manuscripts helped me to develop my ideas. Every evening I wrote myself a long email describing what I’d been working on and how it fitted into or helped to develop my ideas about early modern ballads. As well as the excitement, there was a lot of frustration too. I started to suffer manuscript envy when I looked round to see lots of people typing away on their laptops, transcribing manuscripts in beautiful, legible, italic hands while I struggled with minute, rushed, secretary hands. But I’ve always loved the early modern period; it’s always seemed to me to have the right balance between too few resources and too many, so envy didn’t last long. What was really noticeable, though, was how tiring it was. It’s a special sort of concentrated effort, sometimes a bit like code-breaking, trying to read through all those manuscripts. There’s no one to talk to and not enough tea breaks, especially for someone whose PhD is fuelled by tea. You may remember that last week I was dreading going. Well, as I suspected, I thoroughly enjoyed myself when I got there. Now all I need to do is to weave all my findings into my research. d) I’m away all next week in London, working in the British Library. On Wednesday, I spent the day in Manchester having a long chat with a friend, discussing life, the universe, my husband’s upcoming retirement, my job prospects and my thesis. On the way home I felt an unaccustomed sense of peace – whatever happens is going to happen regardless of how I feel about it. But it didn’t last – by yesterday afternoon I was pretty down in the dumps. I’m trying to put it to one side, but the prospect of the trip to London doesn’t help. More on that later. I spent Thursday and Friday doing some of the fiddly little things that needed doing, such as looking through some of my findings from the State Papers and cataloguing some of the ballads. All things that really needed doing, but somehow, as they don’t produce much in the way of writing, they don’t feel like they add up to much. It’s good to know that I’ve made a bit of progress with them, so that gives me some satisfaction. Yesterday morning I even submitted an abstract for a music conference in Manchester, which will be a bit of a change. So back to the subject of the trip to London and the dread of the post title. This causes me genuine confusion. I know that I will enjoy being in the archives once I’m there and I know that I will enjoy seeing friends and family while I’m down there, so why do I feel not one spark of enthusiasm for this trip? Instead, all I feel is an almost overwhelming sense of dread. It makes no sense at all. I can only assume that it’s something to do with the depression. I can see why people might be worried about supervision meetings and perhaps why panel meetings might cause anxiety, but to have such an aversion to doing something that I enjoy is incomprehensible. I don’t have a lot to tell, this week (after all, it’s only a couple of days since I last posted) so I thought I’d just share the good news that I’d managed to write a bit of my common weal chapter and then post some photos of some of my favourite birds from today’s visit to Martin Mere. Yesterday morning I intended to spend a couple of hours on my common weal chapter, but just as I got stuck in and finally started making something that feels like proper progress, I had to abandon it in favour of looking after a dying hamster. The hamster is still with us, just, but I doubt it will be much longer. The chapter remains unfinished, but I can see a light at the end of the tunnel. I hope it isn’t the oncoming train. To the left is a fibre optic crane. 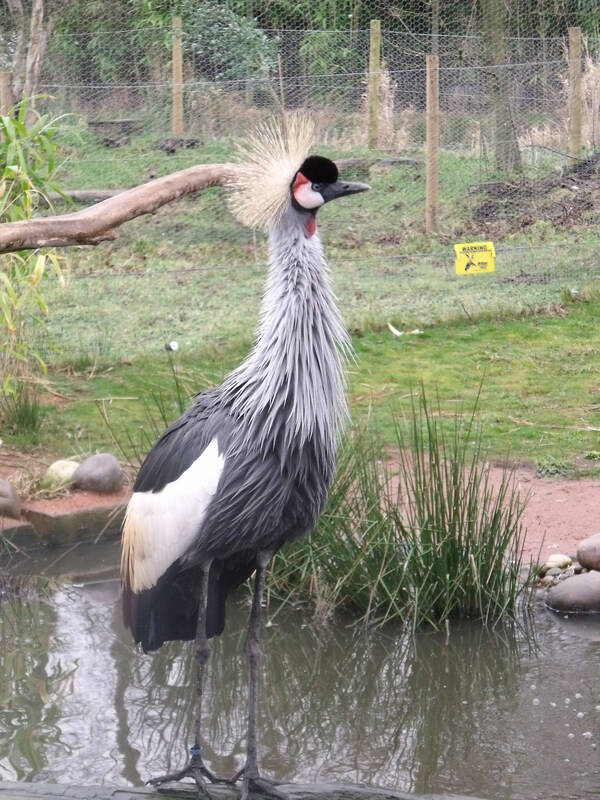 At least that’s what we call it – really it’s a grey-crowned crane. 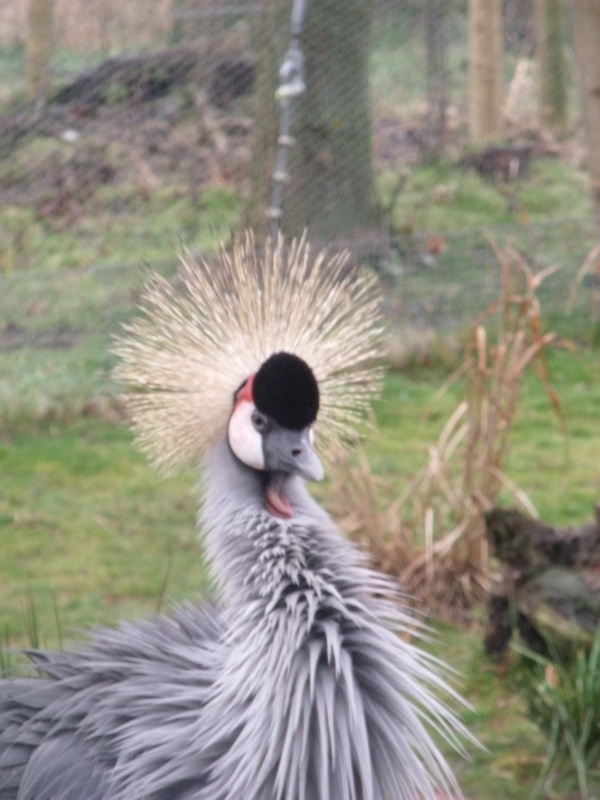 Fabulous creatures. 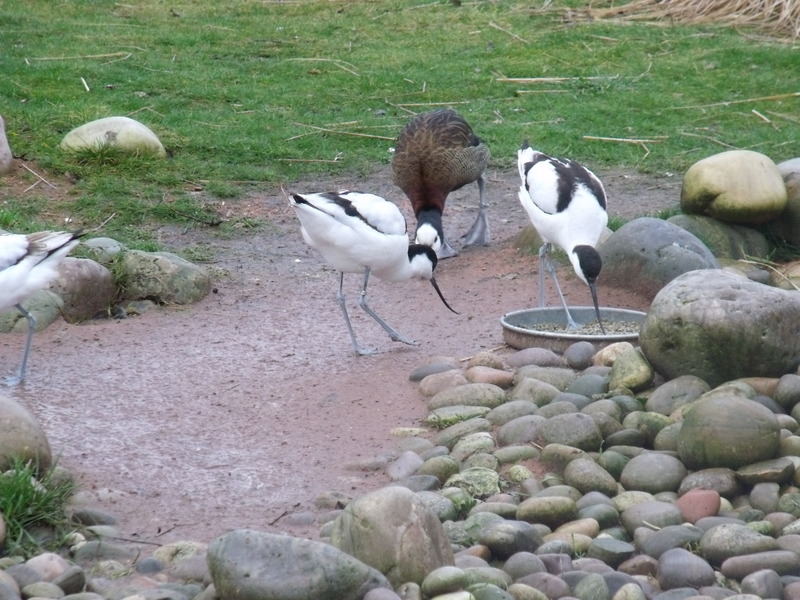 And below are some avocets. The year of big, scary life changes. The year in which my husband is likely to retire and in which I need to become the main breadwinner for the family. The year in which, 20 years after starting at the University of Manchester the first time round, I should earn the title of doctor. 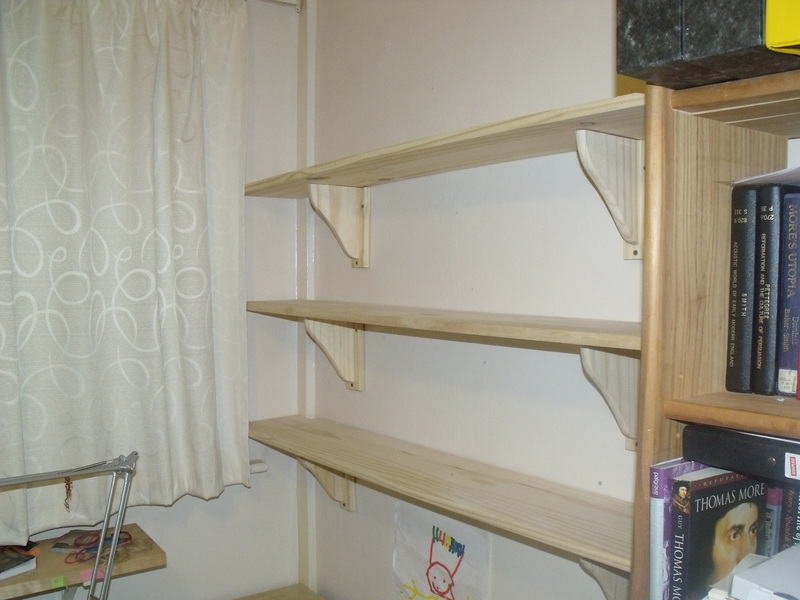 So to end 2013, I got some new bookshelves. I need them because in the last couple of months I’ve accumulated so many books that I’ve run out of space to put them. Two of the shelves on the bookcase in my bedroom are now devoted to post-1950 history, as I was given a lot of high-quality books by a friend who could no longer use them. I’ve also had to buy quite a few texts for my work and, of course, there are the ones that Father Christmas brought for me last week. 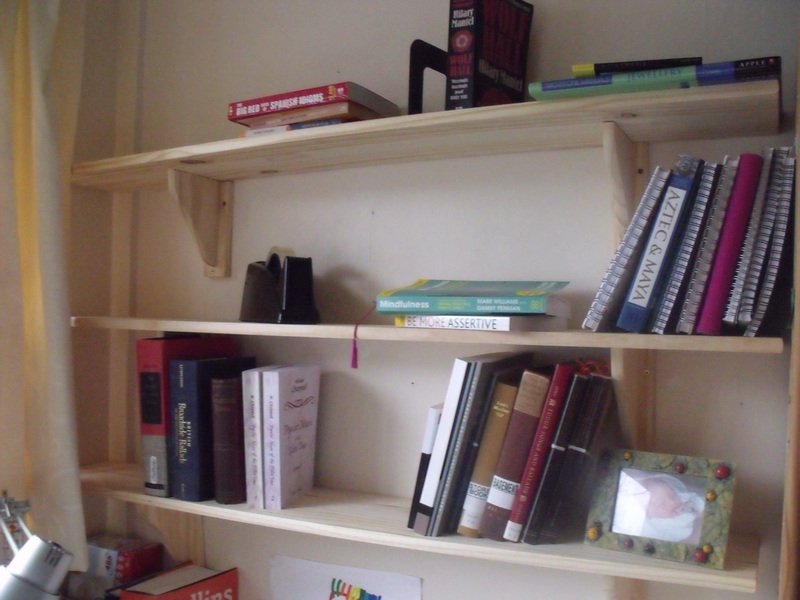 New bookshelves were a must. And to begin 2014, I put some books on them. 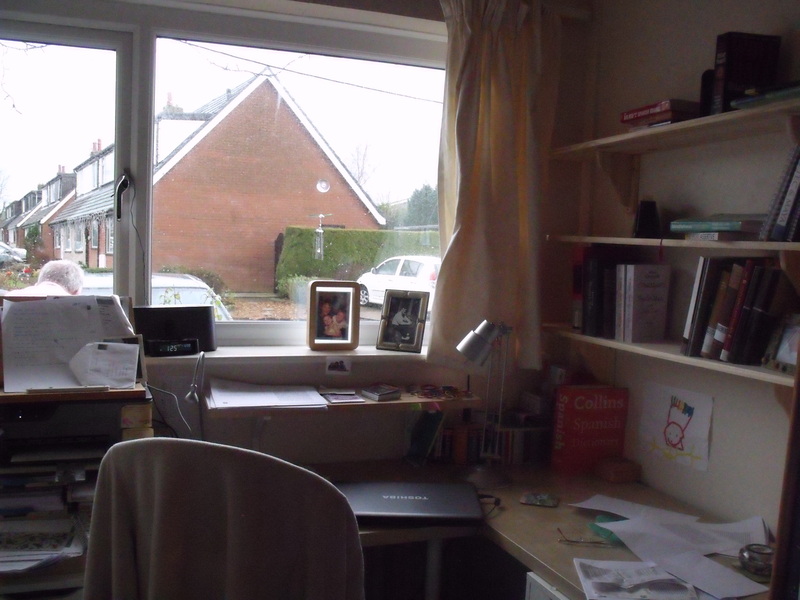 The eagle-eyed among you might have noticed that it required the movement of my printer from my right to my left. This may not seem significant, but it created a strange sense of space. Working in there this morning, it felt like there was a lot more room. I stopped for a moment to consider it, deciding that the space in the corner had been redundant space, because it was trapped between my Spanish dictionary and the printer. Now it isn’t. I’m not sure how ‘working round a corner’ is going to pan out in the long run, but for now it seems quite pleasant. On a more research-based note, I am pleased to report that my chapter finally seems to be coming together. I’m slightly more confident of it than I was. This week, I’ve been working very much part-time, alternating it with playing games with the family and trying to get some fresh air between the raindrops and gales. Somewhere along the way, I have found 6500 words of a chapter, which is interesting because it’s certainly not yet what I’d call a chapter – a lot of it is still in notes, or just lists of primary or secondary quotations. When I mentioned this to my husband the other day, he commented that I had brain incontinence! Puddles of words that don’t have any flow. But, today, what prose there is is finally beginning to coalesce. I’ve read several articles (I could do with going to the library but I don’t think I’m going to get there before the children go back to school next week), ordered yet another pile of books from Amazon and in the evenings, I’ve been cataloguing and analysing ballads, a few at a time. Progress, I think. Yesterday I began an 8 week mindfulness course, a present from a friend for Christmas intended to help me with my depression and stress since I can no longer take anti-depressants. I’ll keep you posted on how it goes.